We are pleased to inform you that we have a new version of the PokerStars software, to reflect the fact that we are now fully licensed and regulated by the United Kingdom Gambling commission. All players who are resident in the UK or British territories will need to upgrade to the new software, which offers you the opportunity to play with the same players in the same games that you enjoyed on the old software. When is the move to the PokerStars UK platform? The migration from our PokerStars.com platform to the new PokerStars UK platform started at 14:00 GMT on November 3. Simply log in to PokerStars with your existing account then follow the on screen prompts to upgrade the software and move your account. Can I create a new account without having to move my old one? No. If you are a resident of the UK and have a PokerStars account, you must move your account to PokerStars UK. Can I move my account on my mobile? Yes, just log in as normal on or after November 3 to move your account. Once completed you can download the new free mobile apps for your device. Once you have updated your mobile app, remember to uninstall your old app and use the new PokerStars UK app to play in future. Same games – same opponents? You will still be able to access the same great games and tournaments. You will also be able to play against the same players as you did on PokerStars.com. The player pool will not change. The whole process should take only a few minutes. You simply need to log in to your existing PokerStars account, then follow the prompts to upgrade to the PokerStars UK version of the software. Your username and password don’t change and you will still have access to all your usual games and promotions. All balances on your account will remain the same including your account balance, FPPs, VPPs and VIP status. These will be immediately available after the move is completed. Will my VIP Club rewards be affected? VIP Club rewards for PokerStars UK will be the same as on PokerStars.com for the remainder of 2014. Rewards will be reduced slightly for 2015; more information will be available at a later date. Are there any tax implications that will affect me as a player? PokerStars, like all other operators, will be required to pay UK gaming tax at 15% from December 1. The impact of this cost may mean that we introduce some changes to our VIP programme (but only from 2015). This is currently being reviewed. We will ensure that players are notified in advance. The introduction of the UK tax will not impact winnings/cashouts, deposits or transfers - we will not be required to withhold taxes from any such transactions. Is there anything that could prevent me from completing the move to PokerStars UK? I have a pending cashout (action: please wait until processed (up to 48 hours), or cancel it through the Cashier -> Pending Cashouts, then complete the steps under 'How do I move my account'). I was registered for a Live event but now I am not, what happened? On Friday October 31st, all UK players will be unregistered from any Live events they were registered for to allow migration to take place. Once you have completed your migration to PokerStars UK, the Registrations team will register you back into those events within 48 hours. Do I have to move to PokerStars UK? Yes, the move is mandatory for all players resident in the UK. If you are not resident in the UK and have been asked to move your account to the UK please email support@pokerstars.uk with your current address details. What if I am in the middle of a tournament when the move is scheduled to take place? The move from PokerStars.com to PokerStars UK software will occur around 14:00 GMT on November 3. In preparation for the upgrade, players in the UK will be temporarily unable to register for real money scheduled tournaments from 05:00-14:05 GMT on November 3. Spin & Go’s will be temporarily unavailable from approximately 13:45-14:05, while the availability of Sit & Go’s will vary according to game type, player numbers and speed. In each case registration will be allowed to continue for as long as possible. How long will it take to move to PokerStars UK? Yes, absolutely. You will not be segregated or moved away from the general population on PokerStars.com at all - PokerStars UK will not change any of this. Can I play if I am visiting another country? You will be able to play on PokerStars UK when visiting another country for a limited period of time. Will player transfers be available? Yes. You can still send and receive transfers to other players and between any paired Full Tilt account. I have an account on PokerStars.FR, can I continue to play on there? No, you will no longer be allowed to play on PokerStars.FR. From 14:00 GMT on November 3, 2014, playing on the French .FR site, or any other licence except PokerStars UK, is no longer possible within the UK. UK-based players using the .FR client need to cashout their funds in the usual way - there is no risk of players losing their funds, but any balance on the .FR client must be withdrawn and re-deposited on the new UK client to continue playing. Assets including Play Money balances, Real Money tourney tickets, T-Money, VIP Status and FPPs can be transferred to your UK account by contacting support@pokerstars.uk and confirming your PokerStars UK User ID. Pending bonuses will be re-credited if possible, or paid out on a pro rata basis if not. Your PokerStars.FR VIP Status will also be applied if it is an upgrade. Make sure you have claimed any earned VIP Stellar Rewards and Milestone Cash Credits from the VIP Store in the PokerStars.FR client prior to 14:00 GMT on November 3, 2014. Additionally, we will provide credits to many players for partial progress toward their next Stellar Reward or Milestone Cash Credit. All credits will be made by November 5 and will be accompanied by an email to the credited player. I have an account on PokerStars.net, can I upgrade to PokerStars UK? 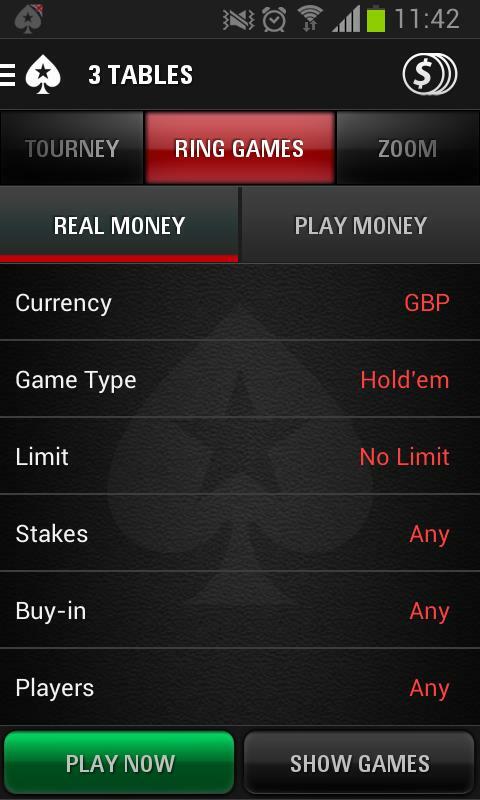 Yes, you can download the PokerStars UK client and enjoy all the new features and options in the new software! Simply download the client from uk.pokerstars.com and log-in using your existing account details. Why can’t I find any games in the Mobile app? 1. Log in to the Mobile app, select ‘Lobby’ and navigate to your preferred game type (eg Ring Games/Tourney/Zoom/Sit & Go). 3. Select a currency other than GBP. 4. 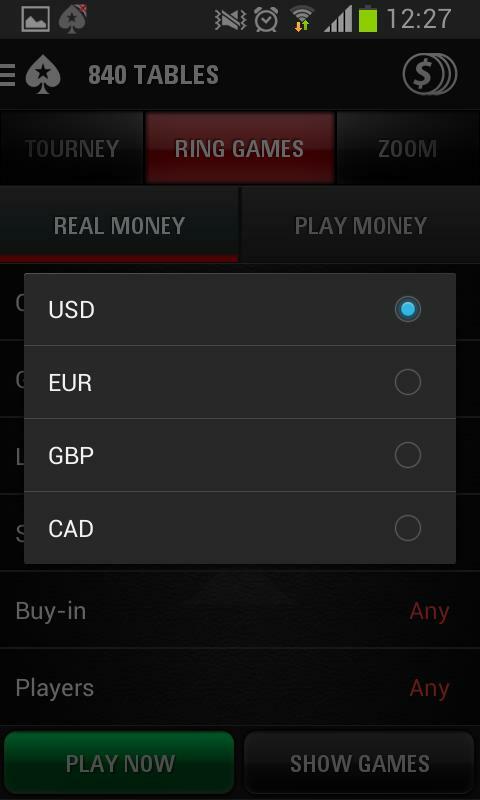 Once you have chosen a currency, select ‘Show Games’ and a list of games in that currency will appear. Feel free to contact support@pokerstars.uk at any time – we are here to help!